Consider the savings, if you have a $20k, 60 month, 5% loan at another institution and refinance it at Capitol View at 4%, that would save you up to $546 over the life of the loan. 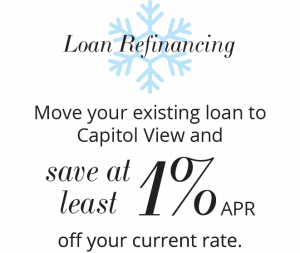 Capitol View will improve your current rate by at least 1% on qualifying loans*. If you are approved for a loan at Capitol View and we cannot beat your current rate, we will pay you $50! *Subject to credit approval. This offer is not valid on loans currently financed at Capitol View Credit Union. This offer does not apply to mortgage loans. 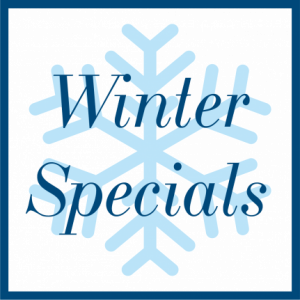 This offer is available for a limited time. Popular uses include debt consolidation, home remodeling, travel, and large purchases. *Subject to credit approval. 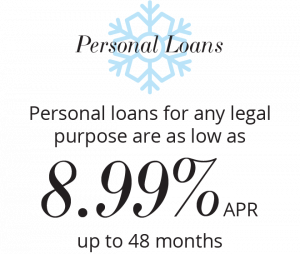 This offer is not valid on loans currently financed at Capitol View Credit Union. This offer is available for a limited time.